Pulaski Hall was built in 1905 and is still operating today. Published April 8, 2019 at 9:02 a.m. 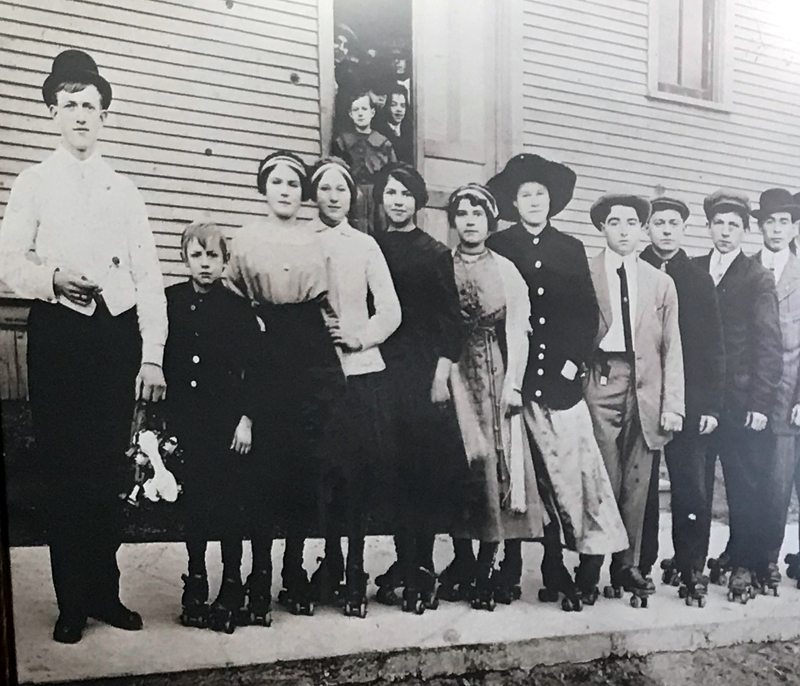 In a town with the kind of Polish population that Milwaukee has, it should come as no surprise that in the early decades of the 20th century, there were at least three Pulaski Halls in the city. The one on the near South Side has been completely erased, its building at 15th Place and Grant Street razed. Similarly departed is the one that stood at the southwest corner of Bremen and Locust in Riverwest. 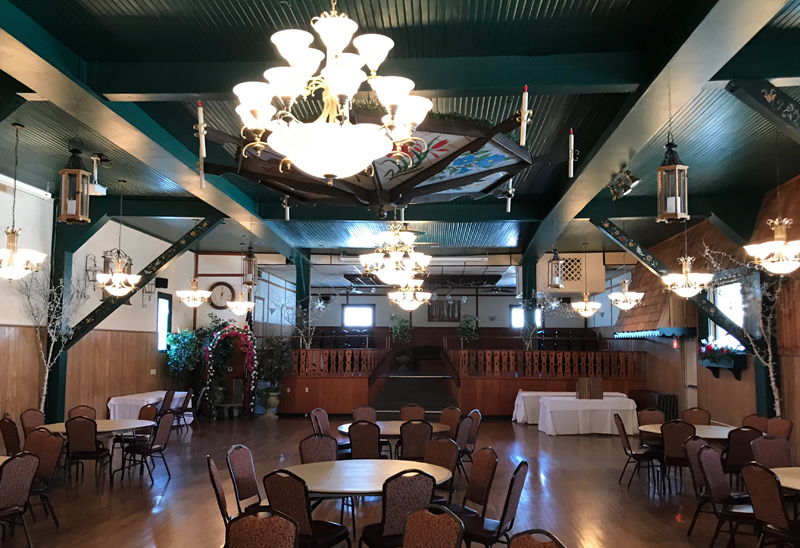 But, tradition runs deep in Cudahy and the Pulaski Hall that was built there, 3900 E. Pulaski Ave., in 1905 not only still stands, it's still operating. And it still bears the name of the "Father of the American cavalry," Kazimierz Michał Władysław Wiktor Pułaski of Ślepowron. 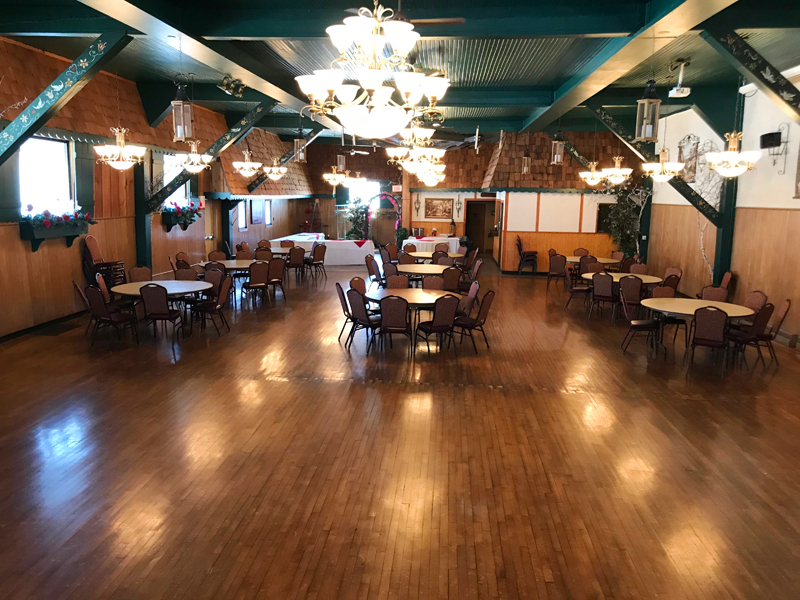 Though there aren't Polish-language performances held in the lovely hall regularly anymore, Pulaski Inn is a community landmark, the site of countless banquets, meetings, wedding receptions, anniversary parties, high school reunions, graduation ceremonies, funeral gatherings and other events that have inscribed themselves not only into individual memories but also into the collective consciousness of this hard-working suburb. Built by Polish immigrants Joseph and Julia Wojtysiak in 1905 as a tavern and hall on the site of what had been a grocery store and small cottage, it appears that at the start, the place bore the name Lakeview Hall and was built by moving the cottage to the back of the lot and, presumably, razing the grocery store. The stage was added to the north side of the hall in 1910 and included dressing rooms and a prompter's booth built into its floor. Conflicting information says both that the first wedding reception was held there in 1916, and that the Wojtysiak's daughter held her reception there seven years after the opening (which sounds like 1912 to me), so we'll have to let that slide for now. 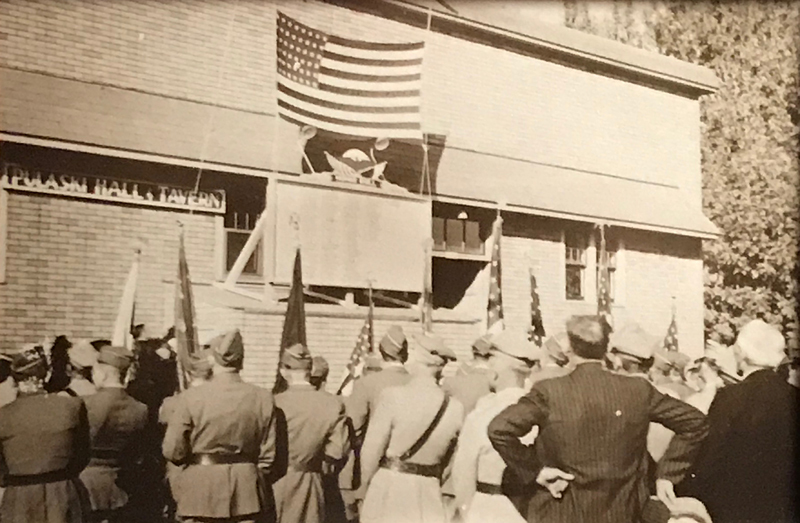 We do know that the hall found no shortage of uses and the open land to the east, now the parking lot was a popular spot for church picnics, both a launching and landing spot for the processions that often kicked off such events. 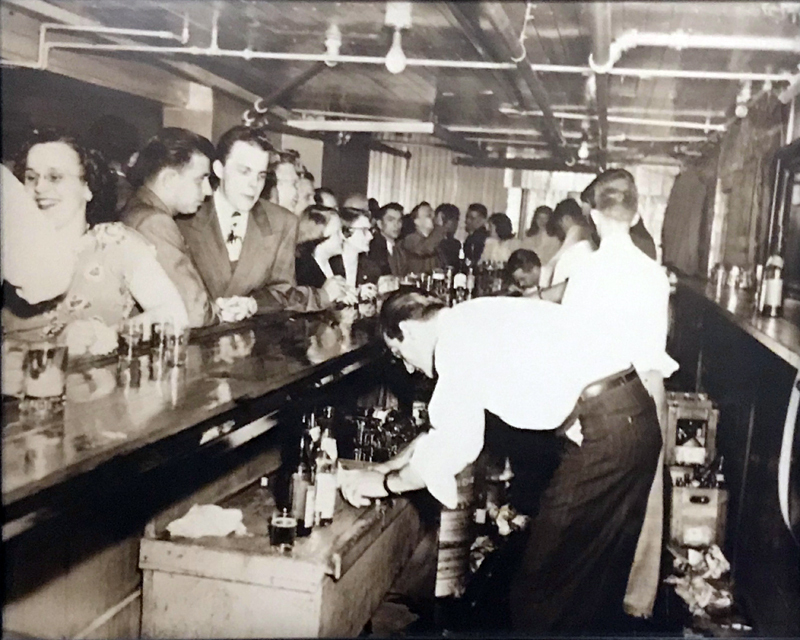 In the early days, only men could enter the bar from the street entrance. Women could only get to the bar from the hall. 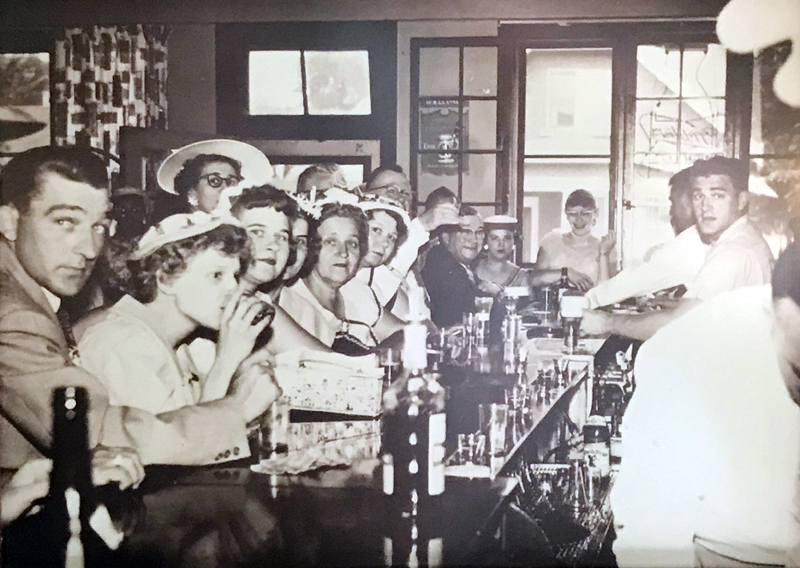 By the 1920s, with Prohibition in force, the tavern became the Pulaski Soft Drinks Store, run by Leo Mackowiak (at left in the photo above) and his wife Sophia, though the Woytysiaks still owned the place. 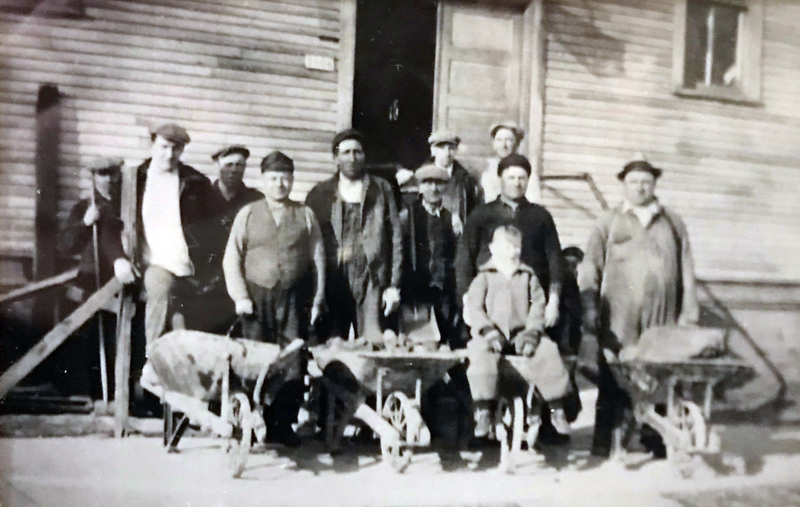 Though Mackowiak made his name in Cudahy as, among other things, a school board candidate and a union representative at Cudahy's eponymous meat-packing plant where he worked more than half a century as a butcher, beginning in 1901, I think we can agree that his greatest achievement was turning the hall into Cudahy's first-ever roller skating rink. 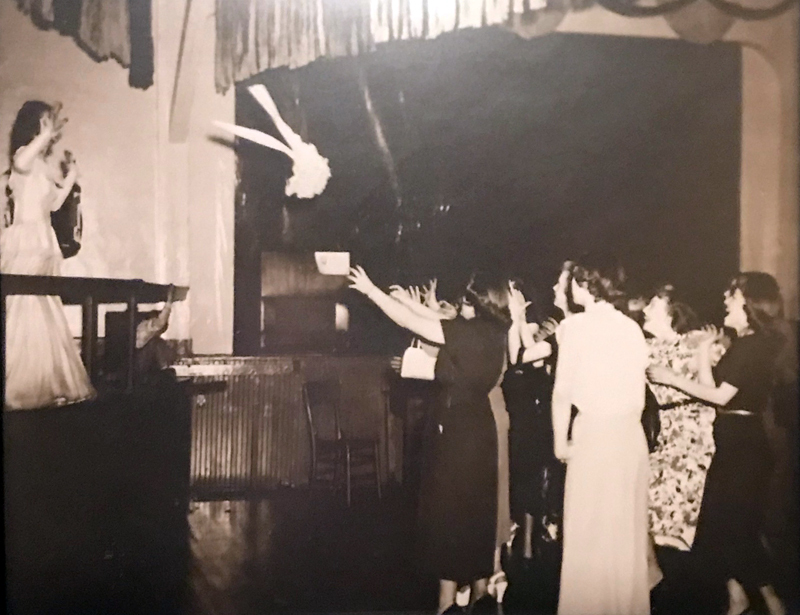 It was apparently during the Mackowiak era, too, that Polish plays began to be staged with regularity in the hall, which soon also hosted bingo and other amusements, some legal, some perhaps less so, with the 19th Amendment in force. 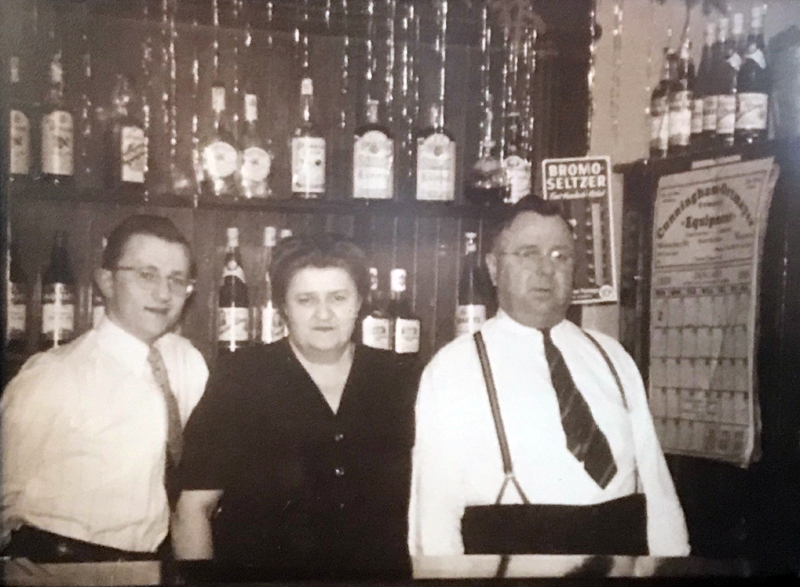 By 1927, a Wojtysiak relative named Stanley Kalman was running the business, but not for long, as the place was sold lock, stock and barrel to Stanley and Stella Glowacki that same year. In addition to operating a tavern and hall, the Glowackis raised their son, Ray, there, prepping him – unbeknownst to him at that point – for his future. The Glowackis renovated the hall in 1936 and created the lower level hall and bar out of, well, nothing. 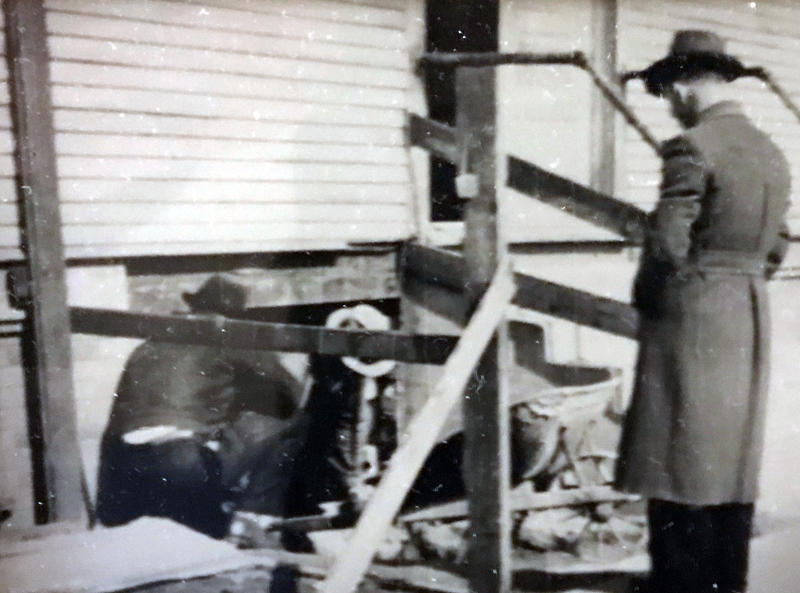 The story goes that thanks to the Depression many neighboring Polish immigrants were in need and the Glowackis hired them to dig a basement under the hall, which had been built atop unexcavated land. 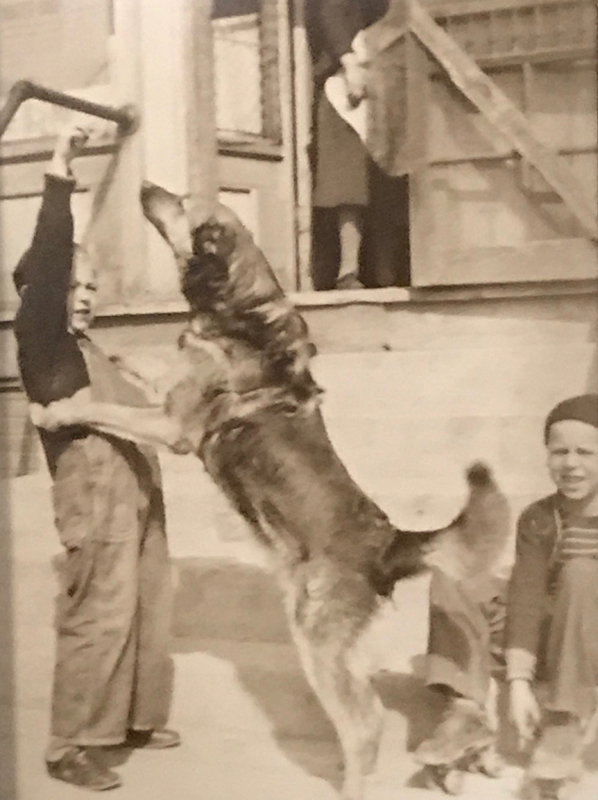 and Ray, below, with his pet dog. So, these guys dug in, set dynamite charges – with the building in use, apparently – ran out and waited for the blast. 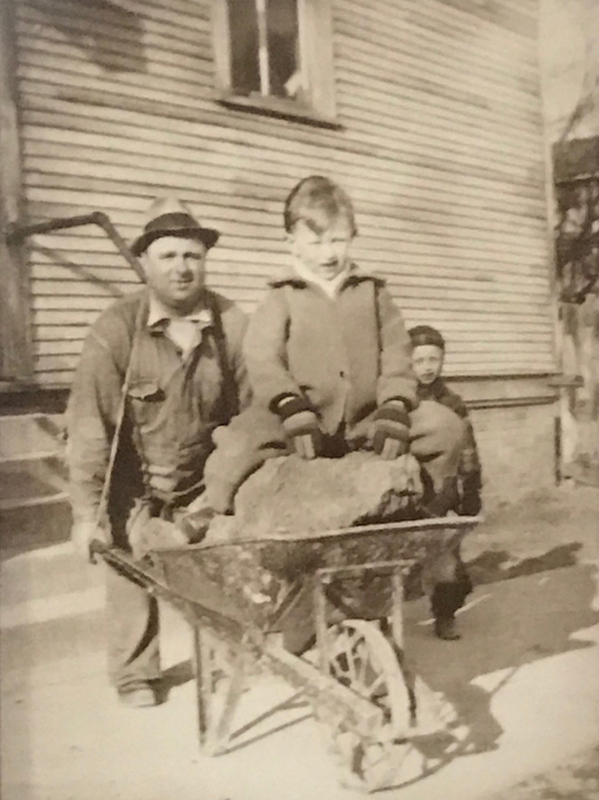 Then they went in and by hand – and shovels and wheel barrows – carried the dirt out load by load and started the process again. 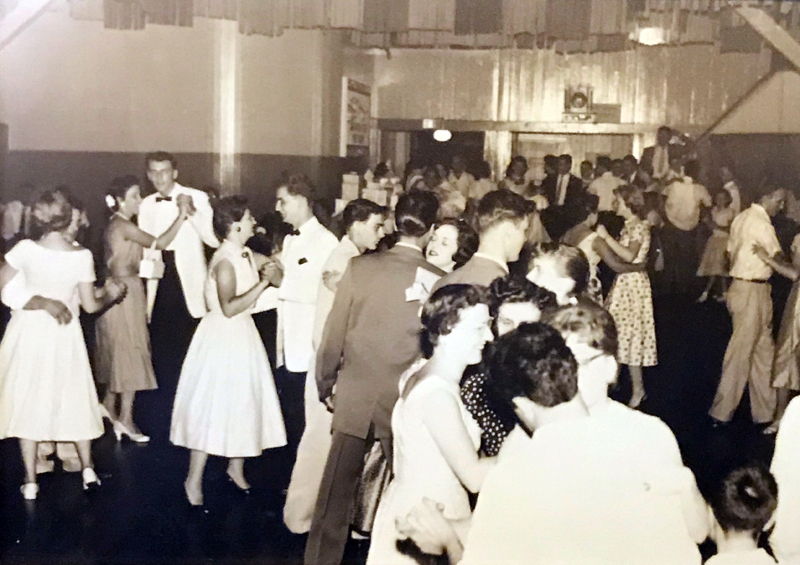 The current owners of the business, Brian and Karen Swessel, are blessed with an astonishing archive of vintage photos tracing the history of the business but some of the best ones capture this process. When a furnace overheated in November 1950, a fire started in the building. It "went up through the walls of the one-story frame building," noted a news report. "Firemen were still battling the flames when the (200!) party guests began arriving" to the surpise party for Mr. and Mrs. Peter Muszynski in honor of the couple's 25th wedding anniversary. "The Muszynskis – and were they surprised, arrived at 8:15 p.m. They figured the party was off, and went home." But, come on, if setting off dynamite in the basement didn't clear the building, would a fire? "When firemen got the blaze out, the 'guests' took over. They cleaned up the dance floor with mops and brooms. Two of them, electricians by trade, repaired the lighting system, which had been knocked out. By 9 p.m., everything was ship-shape – or nearly so. Then a 'committee' went to the Muszynski home and brought the couple back to the hall." Stanley Glowacki faced $4,000 in fire damage, but at least the show went on. Six years later, the Glowackis wanted to retire. Problem was, Ray had just graudated from Marquette University, where he'd studied to become a teacher. There, he met his future wife, Mary, who was also an educator, who had taught for two years at Hopkins Street School in Milwaukee, before the couple was married in 1956. Ray, Stella and Stanley Glowacki. According to a newspaper report, his future mother-in-law chided Ray, saying, "You've got to be crazy not to take over the tavern. Why don't you two try it?" 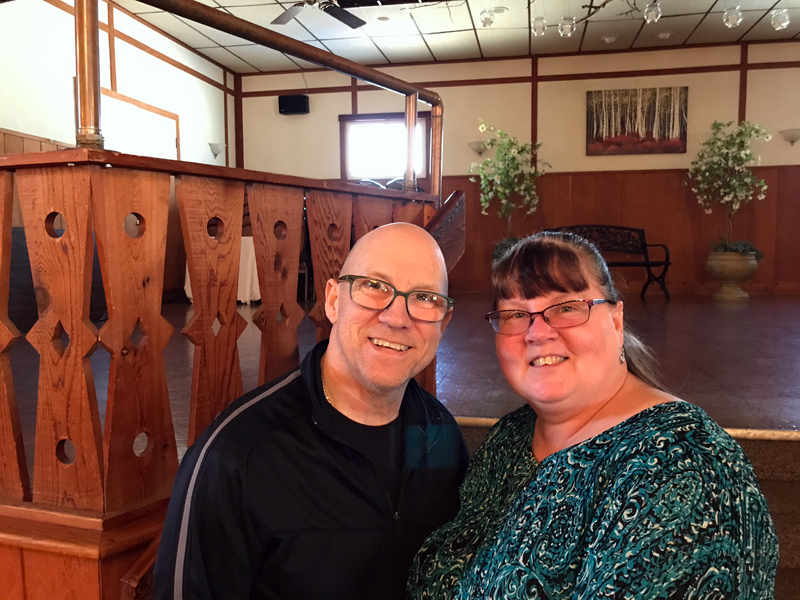 So, a week before they took their vows, Ray and Mary became the proud new owners of Pulaski Hall, and they'd stay there for decades. Pulaski Hall Tavern in 1956. For 13 of those early years (until 1973), Ray taught sixth, seventh and eighth grade at St. Augustine's Catholic School in Milwaukee. While the couple ran the tavern and hall and raised six kids. Mary told a reporter, "My mother helped as much as she could, but the minute Ray came in the door I would light for the kitchen. We opened at 9 a.m., closed at midnight and Ray would be up at 7 a.m. to go to school." 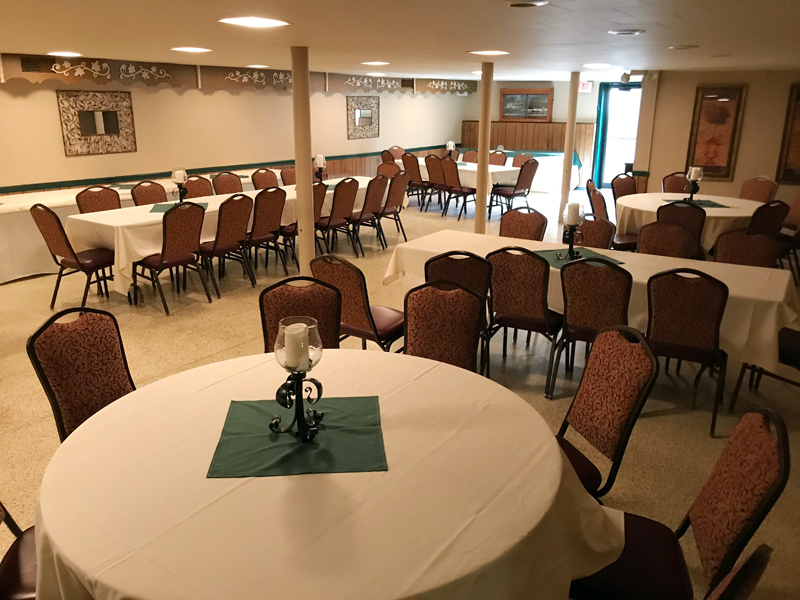 Still, they found time to renovate the place – inside and out – in the 1960s, around the same time they started their own in-house catering business. In 1969, Stanley died, and Stella moved into one of the apartments above the bar, where she remained until she passed away 30 years later. In October 1981, the last show was performed on the hall stage. A cast of children "dramatized the past" in the Cudahy Historical Society's production of "Peacock Zignetts." 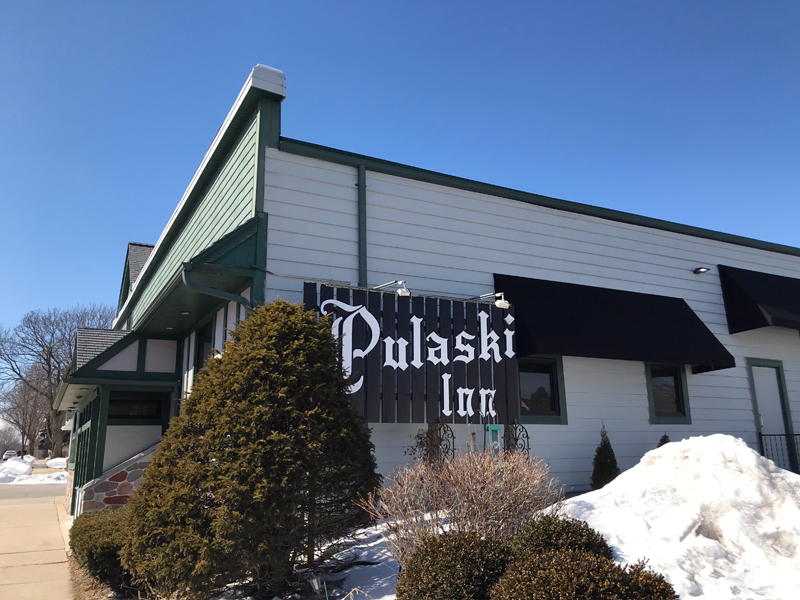 Just before that moment, however, the Glowackis hired chef Brian Swessel, who nearly two decades later – in May 1998 – would become just the third family to own and operate the Pulaski Inn. As you'd expect, after 40 years, Brian Swessel knows every inch of the Pulaski Inn intimately. He shows me the hall and explains where the backstage rooms were, and points out which changes were made and when. And he tells me that when they replaced baseboards in the hall, they found lots of old bottles. "We have a picture up in the attic, I hang it up sometimes, and I always ask people what's wrong with this picture," he tells me, while we talk about Prohibition era shenanigans. "It's dated 1927, and there's the priest and there's Polish dance group and what's on the floor but beer bottles. And we figured it was okay because priest were there and they blessed it." 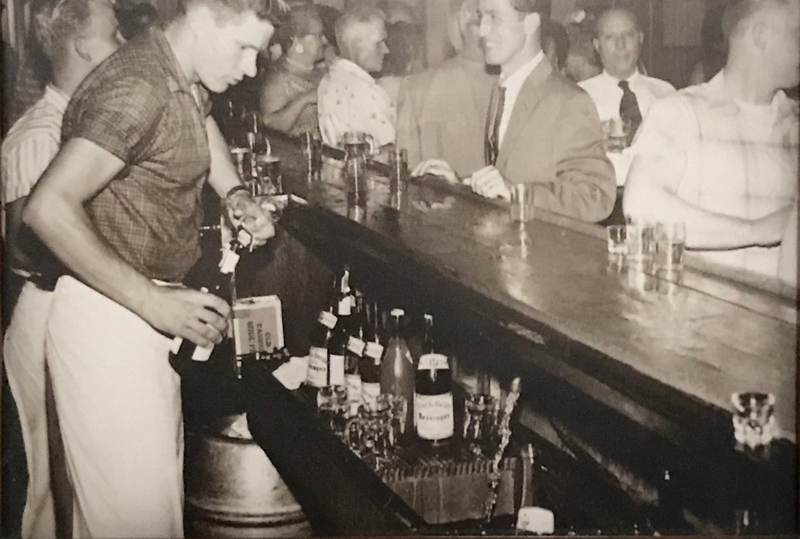 Though he didn't mention the story of the 1943 liquor truck robbery out front, he did say that feds were known to come in and raid the place a generation earlier when Prohibition was still in force. And he says, "we had a cabinet that was downstairs, it was like a pantry cabinet. And you'd turn this little latch and it would come down. The lottery machines were held in there, but they were (hidden and) made look like part of the kitchen." 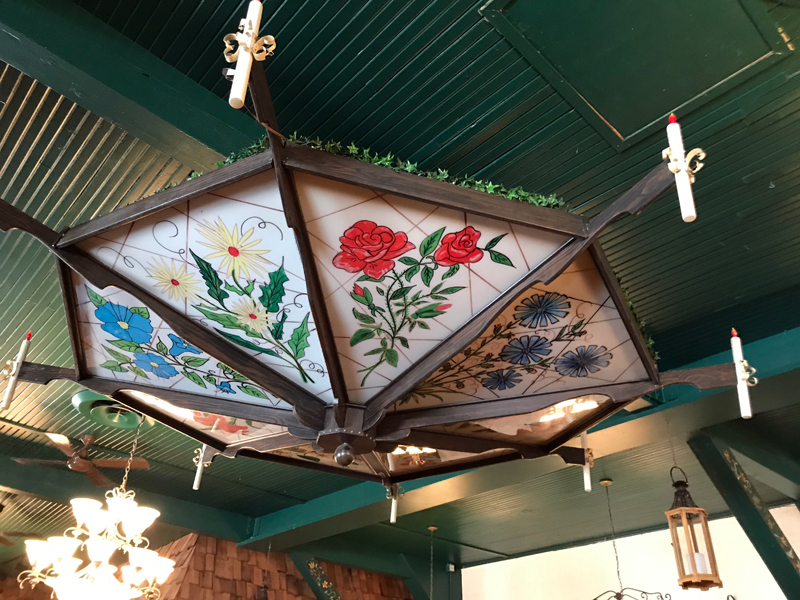 Swessel says the bar stopped operating as a public tavern in the early 1980s and since then the Pulaski Inn has been strictly an event space and catering business. "It was open for maybe two years after I started here, and then it just stopped," he says. "The former owner became the mayor of the town and we started concentrating strictly on banquets. Plus, people started doing open bar (at events) and so then we had to tell our regular (tavern) clients they couldn't come in, because we only had the one bar." Swessel shows me the lower hall (above) and explains the blasting story more in-depth. "Everybody would just stand still. The guys are across the street and they have boards propped and then boom! And then they took wheelbarrows and took all the dirt from this area." Then he shows me the furnace, which he believes is original, meaning it's likely the one that almost, but couldn't quite, cancel the Muszynskis' anniversary bash. Next we see the remnants of the prompter's box, which had been there in Swessel's early days at the Pulaski Inn, but which now is mostly gone. 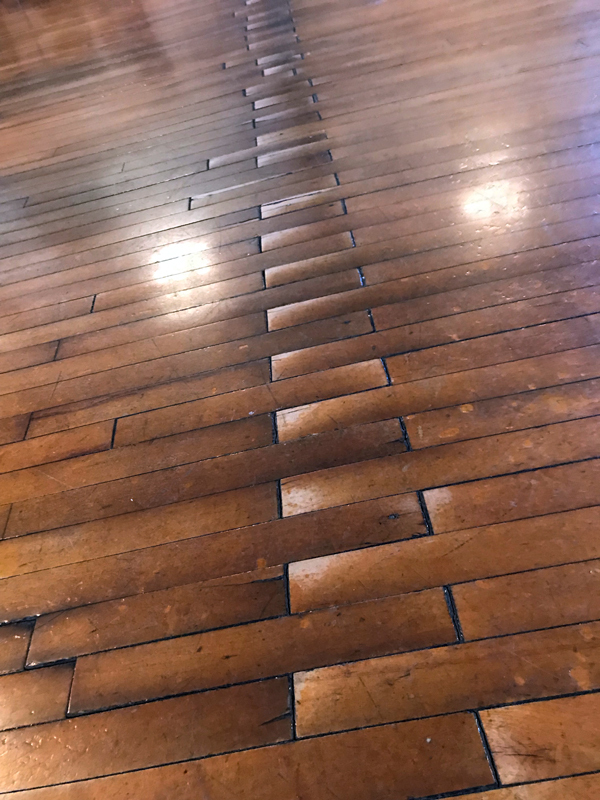 Back up in the hall, he points out the unevenness of the oak floor, the result, he says, of the roller skating back in the day. And in the bar, I ask about the beautiful serpentine bar, which is quite large. 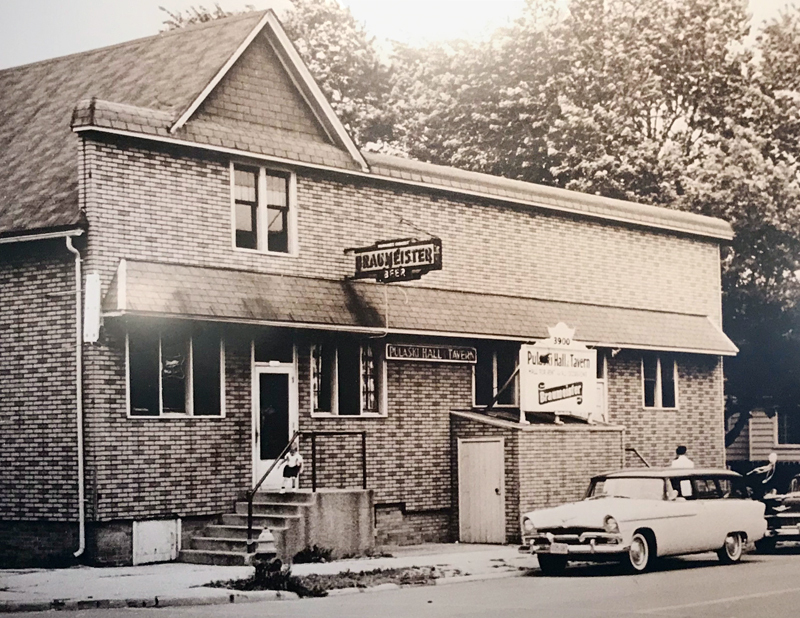 Swessel says that in 1958, a horseshoe-shaped bar from Strachota's Mill Shore Bowl on Capitol Drive was installed as a replacement for the original bar, which had been straight, which was installed in 1905. Swessel says the current bar was installed in the late 1960s. 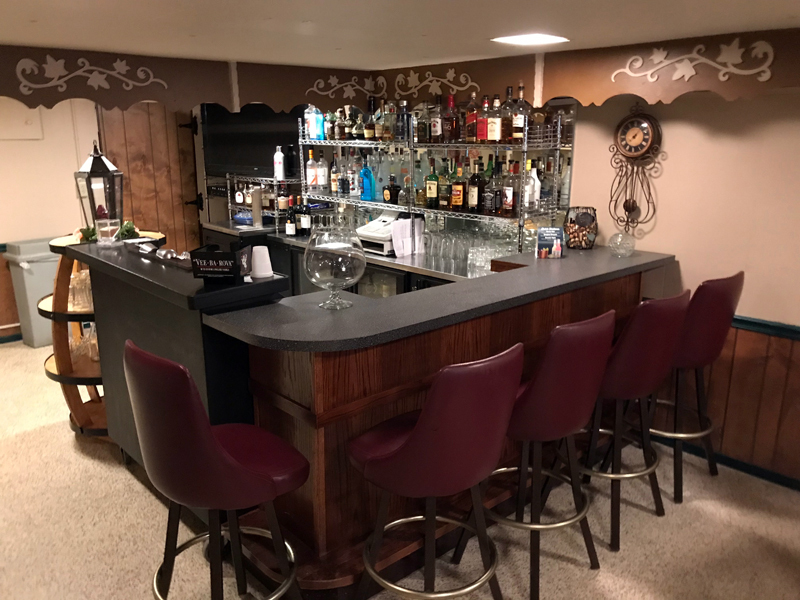 "When the (cooler) compressors needed to be replaced, the bar was remodeled for additional seating and an updated look," he says. 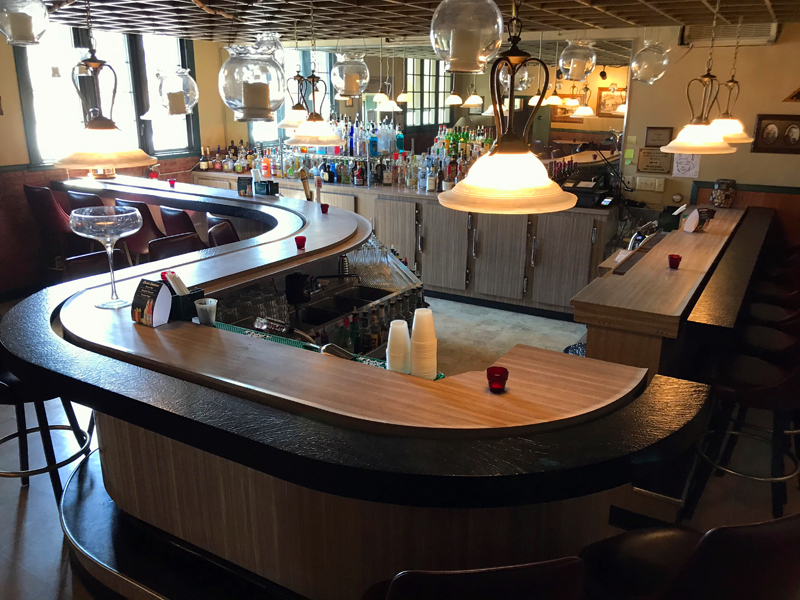 "A bar received in trade from Nino's Steakhouse was installed. It came in four pieces and were fit together to form the bar's current shape." He says that the Pulaski Inn only got about a third of the Nino's bar, which must've been gargantuan. All around there are those vintage photos, framed, preserving for 114 years now, the history of this corner of Cudahy, which, hopefully, will endure 114 more. In the meantime, the Swessels don't appear to be walking away anytime soon, but you never know what the future brings. "In 1998, my wife and I took over," Swessel muses. "The (Glowackis) had six children, none were interested. Which is very typical. We have a daughter, and she has no interest. She'll come and help but she doesn't have the interest or the love of it that I do. "So that's what happens, it just kind of goes through the ranks." That's probably what Stanley and Stella thought before Ray had a change of heart and stayed 42 years.